How important are dental implants? For whatever reason, you may be missing a tooth, or several. Perhaps it happened in an accidental way, or you had to have the teeth pulled as a result of declining dental health. Sometimes, especially when the missing teeth are in the back where we don’t see them as readily, we get used to how it feels not to have teeth back there, and we convince ourselves that it’s not all that important to have dental implants to fill in the gaps. If you are trying to save money by not replacing missing teeth, you need to consider that not doing anything about it may cost you more in the long run, both in terms of actual monetary cost, as well as the integrity of your facial structure. Your teeth are for more than just chewing and smiling – their presence keeps your jaw bone from deteriorating. When you have even one missing tooth, the jaw bone wears down over time. This causes all kinds of changes in the appearance of your face. As the vertical line of the face shortens, the mouth area gradually collapses. At the beginning, this may only cause minor issues such as premature wrinkling and an appearance of advanced aging, but as the problem progresses, there may be more major concerns such as the drifting of the other teeth, trouble with eating and digestion, and damage to the joints that hold the jaw together. If you have one or more missing teeth, you may already be noticing effects like jaw pain and headaches. 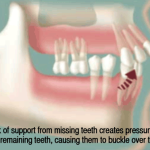 Without the support of all the teeth, especially the molars, undue stress is put on the jawbone. This stress can easily translate into headaches, which you may not necessarily associate with your tooth loss. You can even develop TMJ from not having a full set of teeth. Yes, there is some initial cost to having dental implants put in, but when you look at the alternative of letting the situation get worse, you could end up with a whole mouth of teeth that need work, or worse, teeth that end up beyond repair. And don’t discount the self-esteem factor – even if you think you’re used to not having that tooth there, having it replaced will make you feel so much better and more confident about your smile.